Discount Magic - DIVINE2 by Stathi Zaf. 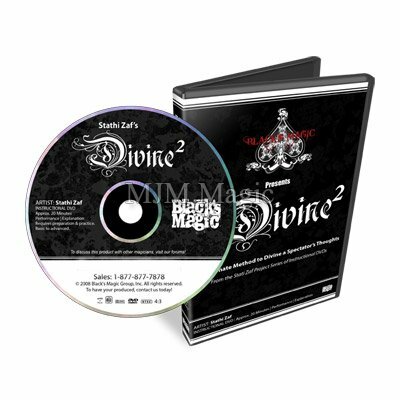 DIVINE2--step into the uncommon mind of Stathi Zaf, one of the most extraordinary underground magicians to ever hit the scene. Combining his deep appreciation and love for magic and mentalism, a passion for engineering, and a critical thinking ability that would challenge the most gifted inventors in history, Stathi Zaf introduces you to one of the most devilish and deviously clever methods ever devised to definitely divine a spectator's thoughts. On the streets and in the studio, Stathi teaches you everything you'll ever need to know to not only construct this diabolical gaff, but to also slay audiences no matter what venue you perform in. And the beauty, is you'll do it right under their noses. Kept secret and only revealed to a select few for many years, Stathi finally shares this fantastic method with you in this informative and educational DVD as part of the Stathi Zaf Project.